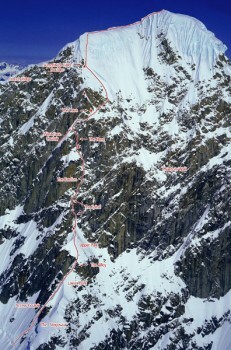 The Harvard Route has become almost a lost classic in the Alaska Range. As soon as it was realized that the West Face Couloir, right next to the Harvard, was the easiest route to the summit, climbers began to overlook the more aesthetic lines on this incredible peak. The Harvard is by all means a pleasing and elegant line, characterized by outstanding pure rock, mixed, and steep aid climbing on some of the best granite in the range. This stunning arête that perfectly splits the west face defines the essence of alpine climbing on a peak some maintain is the most beautiful in all of North America. Which SuperTopo guidebooks include a topo for Harvard Route?